A(nother, albeit old, but still) great article by George Monbiot that has to be shared this Monday morning. Financial crises, environmental disaster and the rise of authoritarianism. A lot of these are results based on an ideology that snuck up on us anonymously. Even though, it's rise (and anonymity) was a very deliberate effort by a small number politicians and economists. As Monbiot describes, its anonymity is both a symptom and a cause of its power. It played a large role in a number of major crises to date: the financial meltdown of 2007-08, the offshoring of wealth and power, of which the Panama papers only offers a keyhole glimpse, the collapse of public health and education (with the main aim being for profit, and not healthy, well-educated thinkers and doers), ridiculous inequality and immense poverty, food waste and insecurity, the epidemic of loneliness, the rise of 'leaders' like Trump, and, importantly, the collapse of ecosystems a.k.a our life support systems. We respond to these crises as if they emerge in isolation - but in fact they are a product of the same coherent philosophy. Neoliberalism sees competition and individuality (and greed) as the most defining characteristic of humanity. It defines citizens as consumers, whose democratic choices are exercised by buying and selling. Of course, advertising and manipulation help shift and shape this apparent form of democracy. Tax and regulation should be minimised, public services should be privatised. The organisation of labour and collective bargaining by trade unions are portrayed as market distortions that impede the formation of a natural hierarchy of winners and losers. Inequality will be 'fixed' by the trickle-down-effect (which we all know does not work). The market ensures that everyone gets what they deserve (and assumes that everyone starts off from the same starting line). In the so-called developed world, we have epidemics of self-harm (suicides are more rampant that war, sickness and murder put together), eating disorders, depression, loneliness, performance anxiety and social phobia. In the so-called developing world we have rampant poverty, food security - despite our natural wealth which we are readily sacrificing for the copy-and-paste approach. Initially, despite its lavish funding, neoliberalism remained at the margins, but as Keynesian policies behan to fall apart in the 1970s as economic crises took hold, neoliberal ideas began to enter the mainstream ("there is no alternative" was the slogan). Thatcher and Reagan pushed it into new frontiers: massive tax cuts for the rich, crushing of trade unions, deregulation, privatisation, outsourcing and competition in public services. 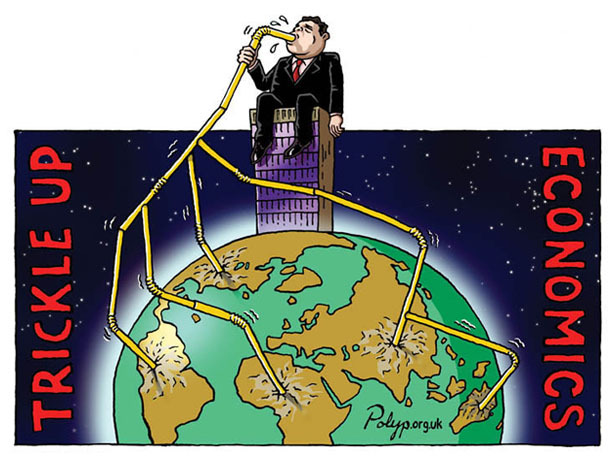 Through the IMF, the World Bank, the World Trade Organisation, neoliberal policies were imposed on much of the world. Confessions of an Economic Hitman is a great example of what this philosophy did to the developing world. Freedom and choice was made a luxury for the rich, freedom from trade unions and collective bargaining means the freedom to suppress wages (or eventually completely automate in the name of efficiency). Freedom from tax means freedom from the distribution of wealth that lifts people out of poverty. Freedom from regulation means freedom to poison water systems, our air, and cause the extinction of species, all in the name of economic growth. As Naomi Klein describes in one of her earlier books The Shock Doctrine, neoliberal theorists advocated the use of crises to impose umpopular policies while people were distracted (case in point, e.g. Pinochet's Chile). Neoliberal policies are everywhere beset by market failures. Not only are the banks too big to fail, but so are the corporations now charged with delivering public services. Business takes the profits, the state keeps the risk. The greater the failure, the more extreme the ideology seems to get. Governments use neoliberal crises as both excuse and opportunity to cut taxes, privatise remaining public services, rip holes in the social safety net, deregulate corporations and re-regulate citizens (check here for instance anarticle I wrote with Lorenzo Fioramonti). This has caused a break-down in our political system, where fascist movements take advantage of the disenfranchised who become more responsive to slogans, symbols and sensation. To the admirers of Trump, for example, facts and arguments are irrelevant to his supporters. And the more we lose, the more we, as the masses, are fearful, and the more we see the rise of authoritarianism across the world. What both neoliberalism and Keynesianism has shown us is that it is seemingly not enough to oppose a broken system. We need to come up with a coherent alternative. Some of us are, based on understandings from e.g. the Meadows Memorandum, we are trying to build a wellbeing economy, both as a global community, and as Africa.